NASA: first lunar eclipse of 2011 occurs at the Moon’s ascending node in southern Ophiuchus. When I read NASA’s findings of where the Blood Moon over the Middle East would begin, I went back to my study on the 12 constellations (fixed stars) and their associated decans that tell the story of Jesus from His first coming to His Second Coming. O-PHI-U-CHUS pronouced of-e-yu’-kes, is the man grasping the serpent. This name is Hebrew and in Arabic is Afeichus, both mean ‘the serpent held’. 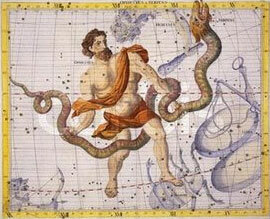 This picture is actually 2 constellations, Ophiucus and Serpens. Is the Blood of Jesus ‘common’ to you?